Got Bees? | Schroeder Roofing Co. Bees have been in the news a lot lately – mainly because they’ve been disappearing – most reports show that there are fewer and fewer bees inhabiting the western US. However, you may be reading this because you wish that bees would vacate the part of your roof or rafters they’re inhabiting! Because the bee population is diminishing we ask that you please DO NOT CALL AN EXTERMINATOR! Colorado State Beekeepers want your reports so that bees can be placed into hives instead of destroyed. Swarms of honeybees present very little danger. As a hive becomes crowded the colony reaises a new queen. A queen and a large portion of the hive will leave to seek out a new home and they “swarm” around the queen to protect her. Click HERE for the Colorado Bee Keepers Swarm Hotline and they’ll help remove them from your property. 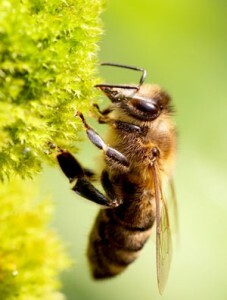 If you need more information about bees, and how to get them removed, click here or give us a call. The Schroeder Roofing team has experience with the bees and would love to help.